Reference number for this case: 31-Oct-54-Colmar. Thank you for including this reference number in any correspondence with me regarding this case. Around 06:45 p.m., several people had seen a "flying cigar". 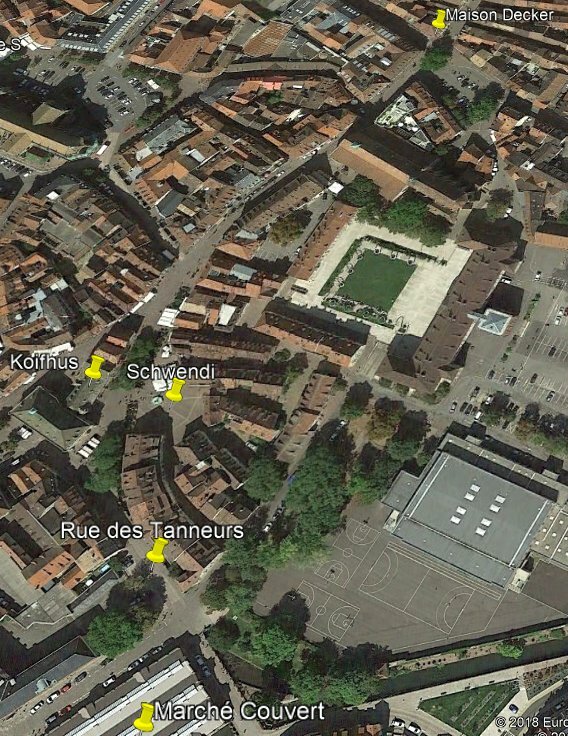 A group of five children aged 10 to 12 was in the Koïfhus square, next to the Schwendi monument, when suddenly one of the children shouted and looked eastward over the houses of the Rue des Tanneurs. There was a "shiny, elongated object, yellow-red at the front and white-yellow at the back", which was moving slowly and lower and lower towards the Koïfhus. The panic-stricken children fled, shouting, except for one, young Christiane R, 12, whose parents lived in the Grand Rue. Like rooted on the spot and hypnotized, she stared at the luminous disc which was descending more and more. The girl suddenly felt "a slight hit on the left shoulder", while at the same time, a luminous ball was visible near the disc. The girl could not move and it was only when the disc climbed above the Decker house that she recovered the use of her limbs. Mrs. A. and Mrs. H., both living in the Koïfhus Square, had heard the shouts of the children and also saw the luminous disk, which was heading westwards. They took care of young Christiane, who was not at all a nervous child, and took her to her parents'. Deeply impressed and trembling all over her body, she could not eat and it was only the next morning, when she was a bit calmed, that she was able to tell her father the event of the day before. The newspaper people say they managed to talk with the other children, and that their reports are in line with that of little Christiane. They had also spoken with Mrs A. of the Koïfhus square. Given the children's cries, she and Mrs. H., who was in her apartment, saw the yellowish-colored disc, and then taking a red color, rising above the Decker house and move away in a westerly direction. According to her, the disc was more like a barrel and moved noiselessly, whereas other witnesses said they heard a whistlinf sound, like the sound of air slowly escaping from a tire. In November 2004, it was journalists from the other regional newspapers, L'Alsace, who reported having found two of the five children who had witnessed the event: Christiane Hofmüller - called Christiane R. in the newspaper at the time - and her sister Danièle Binder. They agreed to talk about their memories of this event, remembering they were on the Koïfhus square with the group of neighborhood children, at am hour when they should have been back home. Christiane Hofmüller said that the object had appeared above the market hall, and had moved towards the children by going along the Rue des Tanneurs, at rooftops height. She was paralyzed by fear, and still cannot explain what had happened to her. She was later nicknamed "the saucer" by the neighborhood's children, but mockery and flying saucers were forgotten with the passing of time, and she acknowledges that the subject never worried her. She talked about it to her husband much later, but her children and grandchildren did not know about it until the last few months. She did not think it could be important for them. She finds today, however, that she, her sister, and their comrades, had experienced something extraordinary, without her being able to define it, and expressed the hope that one day her granddaughters would know what they had seen. "I felt a light hit on the left shoulder and I could not move away from the place", a young girl of 12 years old explained to us. The enigma surrounding the mysterious saucers and the cigars continuous. 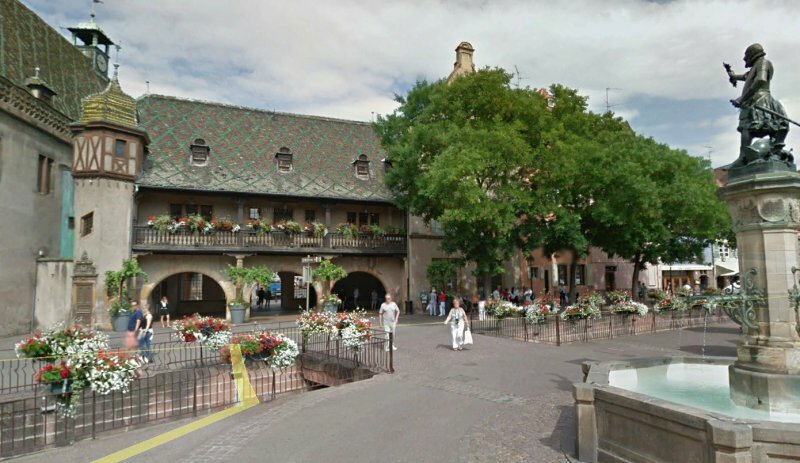 Last Sunday, at approximately 06:45 p.m., several people observed a cigar flying in the sky of Colmar. At that time, a group of five children of ages ranging from 10 to 12 were on the place of the Koïfhus, beside the Schwendi monument. All of a sudden, one of the children shouted and looked at in the direction of the east, above the houses of the street of the Tanners [rue des Tanneurs]. There, one could see an apparition about which much has been written already. A shining object, of elongated shape, yellow-red color at the front and white-yellow at the back, moved slowly and descended more and more towards the Koïfhus. The children, seized with panic, fled while shouting, except one, the little Christiane R..., aged 12 years, whose parents live the Main street [Grand-Rue]. As glued on the spot and hypnotized, she stared at the luminous disc which went down more and more. Suddenly the young girl felt a light shock in her left shoulder. At the same time, a luminous ball was visible close to the disc. The young girl could not move anymore and it is only when the disc went up above the Decker house, that she had control of her members again. Mrs. A. and Mrs. H., both resident of the place of the Koïfhus, having heard the cries of the children also saw the luminous disc, which moved at this time in the direction of the west. They dealt with little Christiane, who besides was not at all a nervous child and they took her along to her parents. Deeply impressed and trembling of all her body, she could not eat and it is only in the morning of the next day, when she was calmed a little, that she could tell to her father the event as it had happened the day before. We had the opportunity to talk with the other children and their accounts agreed with that of little Christiane. We also spoke with Mrs. A. from the place of the Koïfhus. Alerted by the shouting of the children, she saw, as well as Mrs. H. who was in her housing, the luminous disc of yellowish color and changing to red afterwards, to rise above the Decker house and to move away in the direction of the west. According to her, the disc had rather the shape of a barrel and was moving without noise, while other witnesses are said to have heard a whistling sound, as the air escaping slowly from a tire. The dotted line in our picture shows the direction the "flying cigar" took and how it was seen by the witnesses. So this is the story of several people who for the first time, watched one of those mysterious craft in the sky of Colmar. [Photo caption] The dashed line indicates the direction taken by the flying cigar as it was seen by witnesses. It is possible that this is an unmanned V2 we were talking about at the beginning of this article. But for the general public, the veil surrounding these bright objects is not yet lifted. When it is given to us to observe ourselves one of these luminous bodies, we may also convince too many "Saint Thomas" unbelievers. On the site newspaper's website, an article was headlined "Who remembers a cigar flying in the sky of Colmar?" 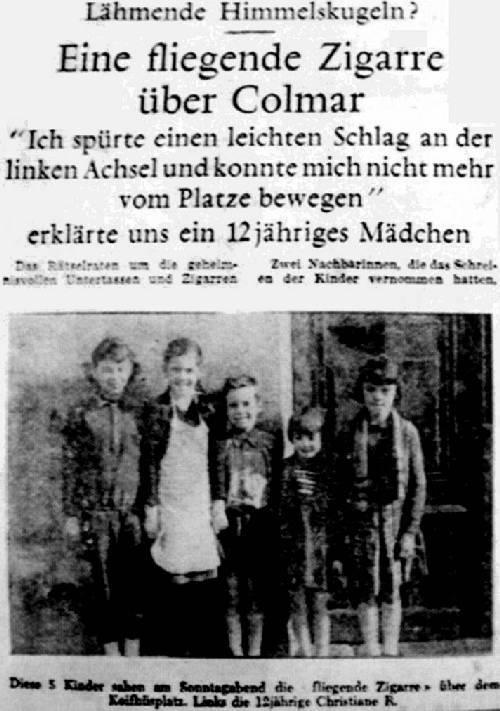 The article discusses the case that occurred in the town center, it gives the circumstances and descriptions and calls for additional witnesses, the newspaper however having already found two of the five children who had been witnesses, Christiane Hofmuller - Christiane R. in the newspaper at the time - and her sister Danièle Binder. Both agreed to tell their memories of the event, seeing themselves again on Koïfhus square with the group of the children of the district, at one hour when they should have been back home. Christiane Hofmüller specifies that the object had appeared above the market hall, and had moved towards the children while engaging along the street of the Tanners - rue des Tanneurs - at the level of the rooftops. She was paralyzed by fear, and is still unable to explain what had occurred. She was thereafter nicknamed "the saucer" by the children of the district, but the mockery just like the flying saucers were forgotten with the passage of time, and she admits that the matter never worried her. She spoke about it much later to her husband, but her children and grandchildren did not know anything about it until these last months. She did not think that it could matter to them. Nowadays she finds that her, her sister, their comrades, had lived something extraordinary, without being able to define it, and she expresses the wish that one day her grand-daughters would know what had been seen. The witnesses were five children from ten to twelve years old at the time of the facts, Sunday, October 31, 1954, among those Christiane Hofmuller and Danièle Binder (current names) who are still residents of Colmar. Christiane Hofmuller was twelve years old, her parents lived on Grand-Rue. Former journalist Christian Valentin in 2012 published a very interesting book retracing the history of UFO sightings and other flying saucers in Alsace, from the origins until 1980. He indicates that among the five young protagonists, Christiane R.and her sister Danièle, today C. Hofmüller and D. Binder, still live in Colmar and agreed to evoke their memories. Christiane above all, a few years older, sees herself on the place of Koïfhus with the small posse of the district, at an hour when everyone should already have been home. "The object appeared above the covered market, and headed toward us by entering the rue des Tanneurs, at the height of the rooftops. I was paralyzed, paralyzed by fear, and I can not explain what happened to me. After this adventure I was cataloged: the neighborhood children nicknamed me 'the saucer'". "Luckily at that age, things pass quickly, and flying saucers afterwards, weren't talked about again. I must admit that the subject never concerned me." "Much later, I do not know on what occasion, I told about it to my husband, but my children and my grandchildren knew nothing until recent weeks. I did not think it could be significant for them. Today, I feel that my sister, my comrades and I lived something extraordinary, without being able to define it. Maybe my little girls will some day know what we have seen." 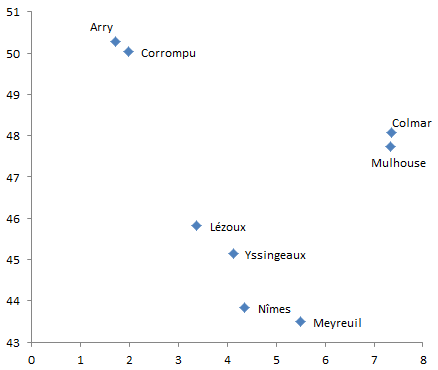 Arry, Somme. No description, no information. Yssingueaux, Haute-Loire. Description of a meteor, except duration too long. Hour given as about 9 p.m..
Colmar, Haut-Rhin. Vague description, witnesses are children. Seen in their East. 06:45 p.m.
Meyreuil, Bouches-du-Rhône. Description fits a meteor, seen going South to North. 06:30 p.m.
Nimes, Gard. Description fits a meteor, seen going from south-Est to North. 06:15 p.m.
Mulhouse, Haut-Rhin. Hour totally different. 04:00 a.m..
Lézoux, Puy-de-Dôme. Possible red moon. Opposite direction, duration 30 minutes, hour unknown. Corrompu, Somme. Opposite direction, 30 minutes sighting. 09:00 p.m.
For the Colmar sighting report, the hour may fit. The description is confused, no angular size, it is not known whether the UFO really flew into the streets of Colmar or if it was distant in the sky. The initial Eastern direction does not correspond to the meteor of 18:15 - 18:30 but it is given by a child, the Western direction given by an adult matches a little better. I thus already think I cannot exclude the meteor. But let's see the places in detail. Several places are mentioned in the sources. The children are next to the "Schwendi monument", so, close to the fountain with this statue (Above picture). The first child who shouts when he sees the UFO, we are told, saw it "towards the East", "above the houses of the rue des Tanneurs". It is not towards the East, but almost to the South about 160°. Christiane Hofmuller would say in 2004 that the object "appeared above the covered market (Marché Couvert), and went towards the children by following rue des Tanneurs". This coincides, it is also towards the South, about 174°, not the East. The object passes over the roofs of the houses of the rue des Tanneurs, so given the location of the children, it goes from their South at 170° to their Southeast at 227°. The two ladies living at the Koifhus Square, who had heard the cries of the children and also saw the disc, said that it was heading West at that time. This is in logical continuity: South, Southwest, West. 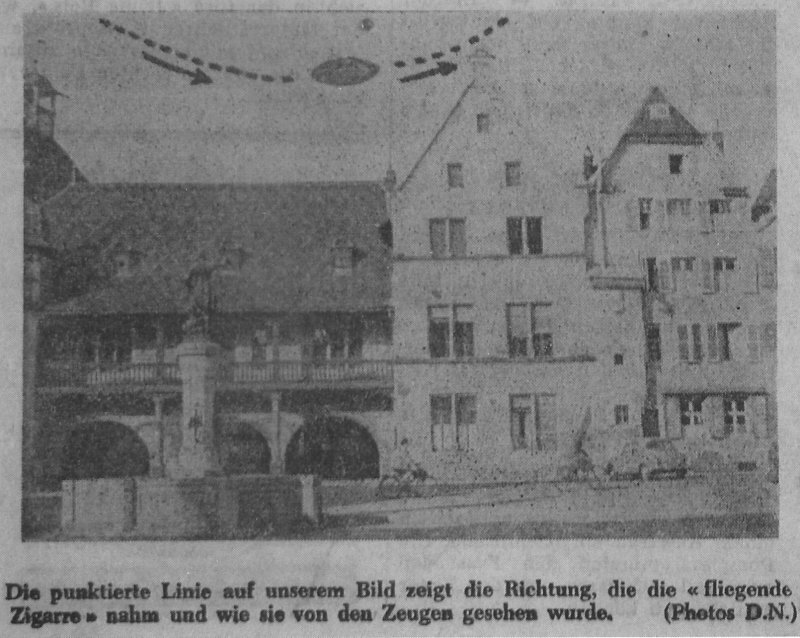 Mrs. A. and Mrs. H. from the Koïfhus, said that the object rose "above the Decker house" and moved "towards the west." It is not the West, but the North-Northeast, around 31°. In the end, we understand that the object did not go from East to West, but globally from South to North. [dn1] Article in the regional newspaper Dernières Nouvelles du Haut-Rhin, German-speaking issue, France, page 8, November 3, 1954. [cv1] "1954, l'année des OVNIS - Des observations par dizaines, des témoins par centaines", article by Christian Valentin in Saisons d'Alsace, quarterly magazine, Dernières Nouvelles d'Alsace publishers, Strasbourg, pp 90-91, summer 2004. [dn2] Article on the website of the regional newspaper Dernières Nouvelles d'Alsace, France, November 13, 2004. [cv2] "Mythes et Réalités des Phénomènes Aériens Non Identifiés - Histoire des soucoupes volantes en Alsace jusqu'en 1980", book by Christian Valentin, Grimoires d'Alsace publishers, France, pp 55-56, 2012. 1.1 Patrick Gross October 31, 2011 A search on the web and in my documentation did not reveal other sources. "Explanations" changed from "Not looked for yet" to the paragraphs on the sightings reports for that day. 1.2 Patrick Gross March 28, 2017 Addition of the Summary. This page was last updated on March 28, 2017.